I often like to cook meals that are easy to re-heat for lunch the following day. It's all about me being practical, I suppose. I also prefer one-pot meals (who wouldn't?! ), but I've realised that I don't actually cook them that often! I feel like any cooking in my tiny kitchen creates so much mess that if I can by any means reduce the amount of washing up I have to do afterwards then it's a mission accomplished. Technically this isn't a one-pot meal though as you will have to poach the salmon separately. It's a superbly easy dish though, and highly nutritious! It's a shame I can't eat more than a tiny piece of cooked salmon (raw and smoked is fine, but for some odd reason cooked salmon makes me nauseous) because this dish definitely has potential. Heat the olive oil in a large frying pan, add the onion and the spices and sauté for a few minutes. Add a little water to prevent the spices from burning. Add the rice, stock, carrots and peas, bring to boil, then cover and simmer for 15 minutes. Fold through the spinach leaves, add the lemon juice and allow to sit for a few minutes. Add the salmon and gently fold to mix. Serve sprinkled with the almonds. I love salmon kedgeree and have at least a few recipes for it but have yet to try cooking it myself. I find I can't eat as much cooked salmon as raw or smoked either - perhaps something to do with the change in its oils through cooking? Well, next time you make this dish and can only have a little - I volunteer to take the rest! I love meals that give leftovers too. 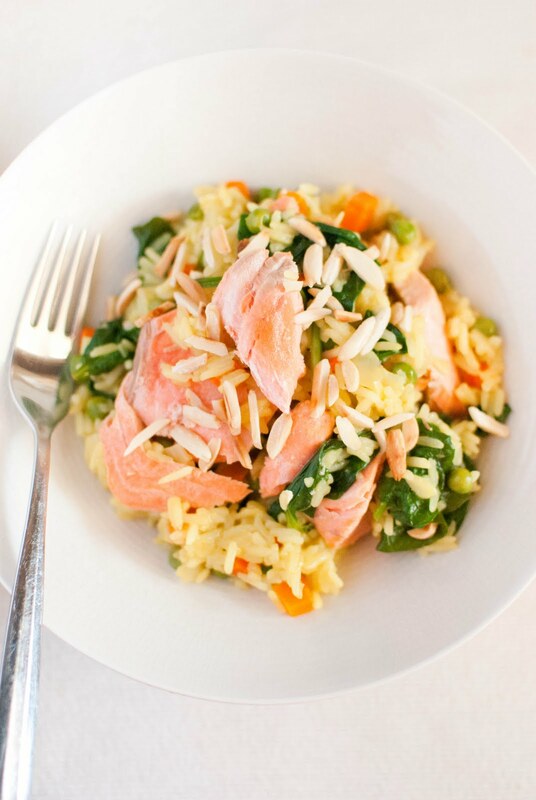 :) Your kedgeree looks fantastic with salmon! I've never had kedgeree, it looks lovely. Lots of beautiful colour. 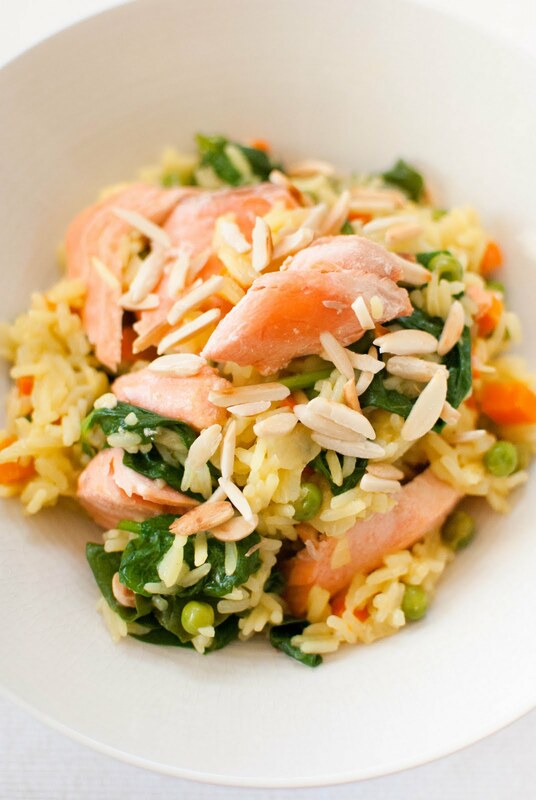 I sometimes make kedgeree using hot-smoked salmon fillet. Could be a solution to your cooked salmon problem! I love kedegree, my mom used to make this with left over fried fish. This looks amazing and definitely brings back memories. This recipe looks so freshing, and I love salmon too. leftovers are fantastic for lunches the next day, bonus!! I'm always looking for new fish recipes, especially easy ones like this. Must try! I tried this for dinner today, it was pretty good! Next time though, I think I'll add much fewer spices, as it ended up tasting a lot like Indian food which I've grown really sick of. I would add some extra spinach and peas though, they went really well with the dish. The poached salmon was amazing with this too, I'd recommend your readers to try this for sure.